In my job at Christie’s I am fortunate to travel to some of the culturally rich cities of the world and I have favourite haunts from Qatar to Cuzco. Living in London, I am lucky to have a wealth of art collections on my doorstep, accessible on foot across parks and gardens and city streets which bear the imprint of history over hundreds of years. 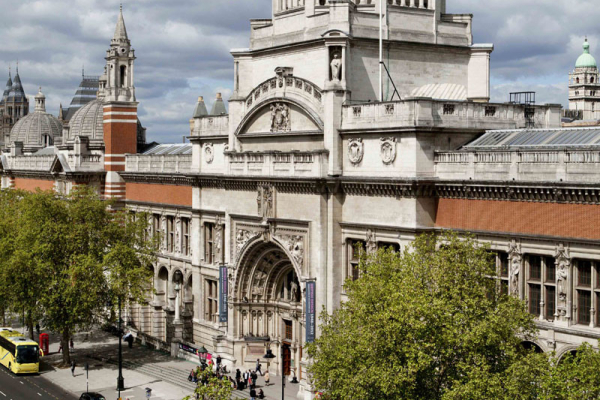 Among my favourite places in the world is Victoria and Albert Museum. This grand institution is a must for anyone visiting the city as it is an unrivalled repository of art and design from the Renaissance period to the present day spanning more than seven miles of galleries! Start on the 6th floor with a staggering succession of ceramics, don’t miss the Indian galleries with their treasury of Mughal jewels, the vast cast courts with their replicas of western sculpture and British galleries, which follow the course of art and design in the country. In between, visit the cafe, designed in the 1860s as the first museum restaurant, or step in to the John Madjeski Garden, designed by Kim Wilkie. And if visiting over the summer, visit the M.F. Husain exhibition in the museum of the final nine paintings from his Indian Civilisation series. From here across Hyde Park, head to the Wallace Collection, a mansion just north of Selfridges formerly the home of the marquesses of Hertford. Full of treasures, the particular strength of the collection lies in the exceptional holdings of French 18th century paintings and furniture evoking the glories of Versailles. Come back to reality around the corner at Busaba Eathai, my favourite Thai restaurant, or at one of the many restaurants in St Christopher’s Place. Through Soho and Covent Garden to the Courtauld Gallery, one of the world’s most important collections of Impressionist and Post-Impressionist Art, set in Somerset House, a palatial complex designed by Sir William Chambers overlooking the Thames. The stately rooms are hung with masterpieces known to all of us from art history books and post-cards, among them a self-portrait of Vincent Van Gogh with a bandaged ear and the Bar of the Folies-Bergere by Manet. From here, walk along the Strand to Trafalgar Square, where on the northwest corner you will see ‘The Fourth Plinth’ a platform originally intended as a base for an equestrian sculpture of William IV. Never built due to shortage of funds, in recent years the plinth has been used to showcase works by leading contemporary artists. You won’t miss the 15-foot-high blue cockerel by Katharina Fritsch currently on view. A few paces along Pall Mall leads you to Christie’s, in King Street, my office. It is a rare day when there isn’t something wonderful to discover in our galleries and unlike the museums I have mentioned, the works on view change each week, covering many categories from Antiquities to contemporary design and everything in between! From Christie’s, walk down Crown Passage, past St James’s Palace and into St James’s Park. Turning around you will see Clarence House, built for William IV when he was Duke of Clarence; and Marlborough House, formerly the London residence of the Spencer-Churchill family. At one time this part of London was dotted with palatial houses of this type belonging to the high aristocracy, many of which were pulled down to make way for new buildings. One such example was Buckingham House, the London townhouse of the Duke of Buckingham, bought by George III for his consort Queen Charlotte as her private residence. It was later expanded into a magnificent royal residence and used as the principle seat of Sovereigns since the reign of Queen Victoria. To the side is a grand portico marked ‘Queen’s Gallery’ leading to a beautiful small museum that showcases works of art from the Royal Collection (www.royalcollection.org.uk). The breadth and quality of the works on view make a visit to this gallery a special pleasure. Afterwards, why not stroll across Green Park and to Brown’s Hotel for a traditional English tea.